When I first saw Black Ghost Fish back in year 2006, it was one of the strangest looking species that I’ve ever come across. Unlike normal freshwater fish that swims around using forward thrust with the push provided from the tail fin, black ghost actually rely on their long pelvic fin that extends from the head until the tail end to navigate and move around. Although I never quite figured out how the fish actually coordinate their movement around the water, what I observe is that sometimes they could even swim in circular motion while at times they even rest standing vertically. My initial thought was that, it was extremely cool and apparently, the fish also looks more like an eel to me. What really caught my attention is that the size and shape were totally different and it led me to think that probably the reason why they got their name as black ghost is because of the pelvic fin which sways just like a moving feet of a ghost. Furthermore, all these were also coupled with their natural all black coloration except for small stretches of white band at the tail. 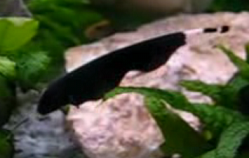 One of the characteristics of black ghost is that it loves to scour the aquarium gravel bed looking for food. In fact, scientific research also point to the evidence saying that they are actually capable of producing a weak electric signal that helps them to locate and pinpoint the source of food. Other than that, according to a friend of mine, who is a fish breeder, black ghost can also eat up smaller sized fish that would fit into their mouth. Therefore, if you intend to mix it to your community aquarium, I would suggest you plan carefully by removing all your other smaller sized pet to another tank, or you just simply have to setup another separate aquarium just to accommodate the fish. Successful breeding of black ghost fish in captive confinement has so far been reported in Indonesia although the actual secret and right method was never been shared. But based on information gathered around is that, those breeders actually use ponds with natural sand bed and basically what decides on their success rate mainly lies on the climate condition whereby the fish is also a tropical species. It has also been reported that in order to trigger spawning, the ratio of female must outnumber the male by 2 to 1, which means that for every male black ghost fish that you have, you will need 2 females to accompany him. Diet is another factor that was mentioned and basically it comprises mostly of bloodworms.